Updating an analog CCTV system with additional cameras to enhance the distance capabilities and adding more recording and storage. Ten (10) new IP cameras were installed including two (2) enhanced range environmental pendant mini-dome cameras. Four (4) 270-degree panoramic cameras and four (4) 180 degree panoramic cameras were part of the installation. These cameras can pan, tilt, and zoom to any areas of interest and can seamlessly stitch and blend them to present the user with a natural continuous panorama. A new network video recorder was added as well as 24 terabytes of storage and IP licenses. Ethernet media converts, power supplies, and surge protection were included. These cameras, whether day or night, are adept at producing high quality images without ever leaving wide dynamic range mode. 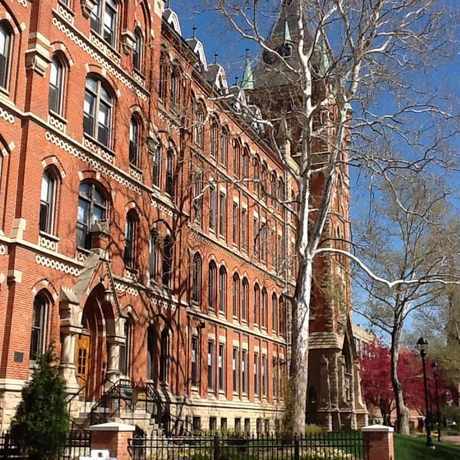 Saint Ignatius High School is a private Roman Catholic Jesuit High School for young men located in Cleveland, Ohio, and has been a customer of our Cleveland office for many years. Most recently, through 2015 and today, our Controls/Security Team has been working with them to upgrade their CCTV and Camera System through a phased project. A walk-thru was completed by our Technology Manager who determined that ten (10) new IP cameras were needed to replace analog cameras to give Saint Ignatius a better view of the West 29th Street parking lot during all hours, not just school hours. Our technicians installed all of the cameras, including mounts, wiring, and terminations and completed all final testing and programming.